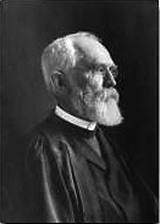 William Porcher DuBose (April 11, 1836 to August 18, 1918) was an American Anglican priest and theologian. He spent most of his life as a professor at the School of Theology, The University of the South, in Sewanee, Tennessee. In the Episcopal Church he is remembered on August 18. DuBose understood that doctrine and life are always in close relationship. Doctrine is more than just theological principles or beliefs. Doctrine forms and guides our life while our life should reflect and manifest our doctrine. One might even say that the incarnate Christ is our life and doctrine. God has placed forever before our eyes, not the image but the Very Person of the Spiritual Man. We have not to ascend into Heaven to bring Him down, nor to descend into the abyss to bring Him up, for He is with us, and near us, and in us. We have only to confess with our mouths that He is Lord, and believe in our hearts that God has raised Him from the dead–and raised us in Him– and we shall live. “Christianity is of course the life of Christ: and as such it is necessarily a life like Christ’s. But, speaking exactly, it is distinctly not a life like Christ’s in us, but the life of Christ in us: not a life resembling His, but Himself our life. Jesus Christ certainly stands to us in the relation of example, but even more distinctly not in that of mere example, but of source, and power, and of content and matter our life. He is our life….” (157). Thanks. I learned a little bit more about him. Thanks for reading my blog and leaving a comment. I hope the post was helpful. do you know of any writings by DuBose that are his thoughts on the Trinity? Terry, I do not know of anything specifically on the Trinity. The DuBose Reader offers a good overview of his theology and has some references to the Trinity. Terry, I realize it has been a year since you posted the question about DuBose’s view on Trinity. But, it the interest still is alive for you DuBose work on the subject at the end of his book The Gospel in the Gospel. The book can be found online for it is in the public domain.